I adore Prague. I also adore unusual, quirky, and weird things. So my trip became one big quest to find unusual things to do in Prague, and to be honest, there was a lot to choose from. Prague: you’re beautiful, but you’re weird. There are so many unusual things to do in Prague. And that’s an awesome thing, because it lifts your trip out of the ordinary, and takes it into the realm of the extraordinary. So let’s have a look at the cool, the quirky, and the weird! Click here to read about some unusual (yet totally awesome!) Prague souvenirs! Or if you want the crazy to keep going at your accommodation, check out this guide to Prague’s 5 best party hostels, or have a look at the 3 coolest hostels in Prague here! Yup, you read that right. I told you; there’s some really unusual things to do in Prague. These gigantic, terrifying, barcode-faced babies crawling around the grounds of the Museum Kampa are thanks to Prague-born sculptor David Černý, and will undoubtedly provoke a reaction from fellow visitors (usually “WTF?” In fact, you can check out these Crawling Babies reviews just to gauge the average visitor’s horror). Yes, they are huge. Yes, they are completely menacing. But they’re also a fairly awesome photo-stop; most people tend to wait until the crowds are a little clearer, and then climb the statues to sit on their backs. But you can also do what my boyfriend and I did, and turn them into total nightmare fuel. Thanks for the sleepless nights, David! The Petrin Tower is a copy of the Eiffel Tower. If you climb to the top of the tower, you’ll even be at the same altitude as if you were at the top of the Eiffel Tower, except that Petrin allows you to cheat by being situated on top of a large hill. Less steps, but an equally awesome view! Plus, you don’t even need to climb that large hill; you can catch the Petrin Funicular to the top. Prague: making life easier for lazy people since 1891. As well as being one of the most unusual things to do in Prague, it’s another fantastic photo spot – the views are definitely instragrammable! You can also choose just how high you want to go for them: either to the outdoor platform halfway up, or an enclosed capsule right at the top (it’s kinda windy up there). If you’re really lucky, you can do what I did, and climb the tower just at the split second that the Czechs fired a whole battery of ear-splitting cannons about fifty meters away, in order to celebrate one hundred years of the first republic. That Anxious Traveller is not responsible for any pants-related accidents which may occur as a result of this. Ahh, how to describe the KGB Museum… It’s an experience. Definitely an experience. It’s also probably one of the most memorable things you’ll do in Prague! This is not a museum where you can casually stroll in and look around the exhibits; you’ll be on a tour (note that it won’t go ahead if there’s not enough people). The plus side to this is that you’ll be guided through all of the exhibits and their various uses by the museum’s highly-enthusiastic Russian owner, who is worth the entry fee alone. He really knows his stuff, and he’ll demonstrate the uses of guns, ballistic daggers, poisons, and other pointy things. He’ll also demonstrate the effect on the victim (usually himself, or a nearby mannequin). Best of all, he’s quite happy for you to handle guns, try on hats, and basically put your eager fingers on all the spiffy spy gear that isn’t in a glass case. Just don’t touch the blades – some of them are still sharp, and he has the blood spatters on the wall to prove it (“Man two months ago, touched blade. Blood is down there. Hospital is ten minutes away, not a problem”). It’s honestly hard to describe just how much fun the KGB Museum is; go visit! Or at the very least, check out some of the KGB Museum reviews on TripAdvisor. Trust me. No, these aren’t at Prague Zoo. There’s no spray-painting of animals by some sicko. Instead, we’re heading back to Kampa Park for some more art! Head down by the river, and you’ll see a line of 34 cute little penguins, who are tidily lined up along the bank. But these penguins hold a secret meaning. According to the Cracking Art Group, who were responsible for the city’s most famous flightless avians, the penguins are all made from recycled plastic bottles rescued from landfill sites. So as well as being adorable on the banks of the River Vltava, they’re actually sending out a message about our need to crack down on plastic usage, and start looking after our environment. That’s a message we can all get on board with, and the penguins, far away from their home in Antarctica, convey it well. But this is a list of unusual things to do in Prague, so how can we make them weirder? Simple: go and see them at night, and these conservation-conscious critters will be glowing a bright, luminous yellow. You can even see them from way over on the other side of the river! No, not the knee of your fellow travellers! Put that tourist down! Bad! What might sound one of the very most unusual things to do in Prague is actually one of its most appetizing! Pečené vepřové koleno is roast pork knee, one of the signature dishes of Czech cuisine, and it’s absolutely delicious. After ordering, you can firstly expect your eyes to fall out of your head with the incredulity of it all when your waiter brings your dinner over. This is not a little piglet knee; this is a huge great joint of meat, with the bone still running through the middle of it. You can also expect the skin to crisped to perfection (fans of crackling are in luck! ), and the meat underneath to be deliciously tender – you’ll generally be given a serrated knife to help deal with your meal, but it’ll often fall off the bone. Any doubts you ever had about eating the knee of a pig will soon disappear, even as you experience pangs of guilt about those cute little piggies. But eating roast pork knee is definitely an experience which shouldn’t be missed, and it gives you some great, if somewhat bizarre, bragging rights when you get home! I sampled mine at U Švejků; it comes highly recommended! I don’t know about you, but the last time I tried to drive a car of the surface of a river, it really didn’t end well. The local constabulary weren’t happy with me. Especially since I don’t have a driving licence. Rejoice, because the pedalo rental company on Slovansky Island allows you to live your dreams, and experience one of the most unusual things to do in Prague at the same time! Hiring out a pedalo and cruising along the river is hopelessly romantic, but alongside the standard boat and swan-shaped pedalos (which must come as a surprise to the actual swans who live on the river), you can hire ones shaped like a Praga Alfa. If these cars look suspiciously familiar, it’s because you’ll see them quite a lot in the city center, hired out for tours. But driving cars along the road is totally boring! Rivers are the place to be! If you agree, head along to Slovanka Boat Rental and grab one for yourself, before taking to the waters to glide by the Charles Bridge at sunset. It may be a quirky way to do it, but it’s no less beautiful a sight. Regular readers of this blog (hello! I love you!) will know of my fondness for the Czech character Švejk, the titular character of The Good Soldier Švejk. A satirical novel about the First World War, and the people who volunteered to fight in it for an empire they had no loyalty to, Švejk is one of those characters who may be incredibly stupid, or the cleverest person there. No-one’s ever entirely sure. In the book, Švejk’s local pub is called the U Kalicha – except that it’s actually a real place that was included in the book, and you can still go there today! It’s a wonderful pub, with a seeming tolerance to visitors leaving their mark on the walls (as long as you don’t mess with the illustrations), but what turns it into one of the most unusual things to do in Prague is the presence of Švejk himself! If you’re there during the day, you’ll often see a lifesize Švejk sitting on a chair near the door, with an empty chair conveniently placed next to him. Feel free to take a selfie with Prague’s favourite patron, though consider leaving an extra tip or buying a souvenir from the shop in return. This must definitely quality as one of the most unusual things to do in Prague. If not, like, the world. The church of Our Lady Victorious has a very unusual statue of the Baby Jesus. In its original form, it looks like a fairly standard statue, a wax-coated image of Jesus in a simple robe. But plain robes aren’t nearly cool enough, so the local worthies decided to make gowns to dress it up in. It even had tiny gowns, specially made, donated by the Emperor and Empress of Austria. These days, the statue has about forty-six robes (which is more nice clothes than I have *cry*), and you can see a lovely selection of them by going to the back-right corner of the church, and heading up the spiral staircase. There, in glass cabinets, are the perfectly preserved robes, some of them ancient and obviously fragile. However, my radar for all things quirky took me to the far end of the little exhibition, where I discovered… Jesus’s poncho and sombrero, donated by devotees in Mexico. The thought of the Baby Jesus dressed up in a poncho is so adorable that I just can’t. Alas I can’t find any photos of the statue in the costume; I am now living for that day. Famed author Franz Kafka was a son of Prague, and the city is rightly proud of him – you’ll see a good number of public buildings, restaurants, and shops named in his honour. You can even go into his house in Prague Castle, or visit the Kafka Museum. But that’d be way too mainstream for this list! We want unusual things to do in Prague! So, how about going and standing in front of his giant, silver, rotating head? Well, now your dreams can come true! Thanks to David Cerny (he of the nightmare fuel babies, and various other quirky artworks around the city), you can pop along to the Quadrio shopping centre and see the constantly-moving statue of Kafka just outside. It’s strangely hypnotic, oddly beautiful, and a whole lot of weird. You’ve heard of a golem, right? No, not the creepy dude who stalks hobbits and talks about his ‘precious’, in a voice that nearly everyone on the planet has attempted to do an impression of (including you; admit it). No, this is a Golem, an anthropomorphic being from Jewish folklore. They are created from mud, and can be either a protector of the weak, or a monster. We’re talking about the legendary Golem of Prague in particular; it’s so legendary, it’s even got its own title. Legend has it that the Rabbi of the city created the golem from the mud of the River Vltava, tasking it to defend the Prague ghetto’s residents from anti-Semitic attacks. However, after some shenanigans which either involved the Rabbi forgetting to de-power it, or the golem falling into unrequited love, it went on a bit of a rampage. Oops. However the day was saved! Yay! And the golem was stored for safe-keeping in the attic of the Old New Synagogue (which has a quirky name in itself, I think you’ll agree). You can visit the synagogue, though not enter the attic itself – is it because there’s something sleeping in there…? If you look at the Instagram account or blog of a lot of people who’ve visited Prague, you’ll see a photo of them holding a tasty-looking cylindrical cake. This is a trdelník, or a Czech chimney cake, and it is indeed a yummy confectionery treat. You’ll see them an awful lot in the Old Town of Prague, especially around both ends of the Charles Bridge and the Old Town Square: stalls with long strips of dough wound around a spit, then cooked over the heat. On removing this tasty, cinnamon and sugar coated cylinder of delight, it’s often filled with jam, Nutella, chocolate, or ice cream. Because trdelnik is NOT a traditional Czech thing. It’s not remotely Czech. It is there purely for the masses of tourists, and it not local in any way. Eat it, enjoy it, delight in the contradiction! But don’t think for one minute that it’s traditional. The awesome Janek Rubeš of Honest Guide explains it way better than I can – take it away, Janek! Not just any wall – put those spray paints down! Tagging the town hall is not cool; jeez. It’s okay, I knew you weren’t going to do that, because you’re an awesome person with great dress sense and morals. But if you feel the urge to give in to your creativity in public, then one of the most unusual things to do in Prague has you covered. 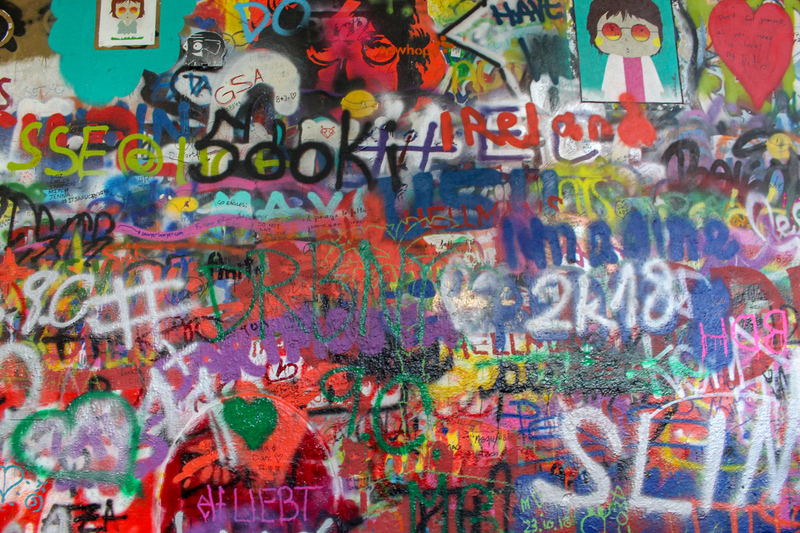 The John Lennon Wall is, on first sight, just a wall covered in graffiti. Look a bit deeper, and you’ll see recurring images of John Lennon, and perhaps snatches of his lyrics painted on. This is because the wall was used as a protest during the city’s dark days of communism, when western music wasn’t smiled on by the authorities. The wall kept being whitewashed, but the images would be immediately repainted upon them. These days, the wall is owned by the Order of the Knights of Malta, and they’ve sensibly abandoned trying to keep it looking nice. So yes, you can add your contribution, and not get into trouble! But please, just respect the history of the wall, and add something a bit more profound than “I LUV TRACY”. Because who doesn’t like seeing dismembered body parts! It’s okay, guys, this one is very old. And it’s, uh, in a church. The church of St James the Greater is a beautiful, baroque building, and would be well worth a visit even if it didn’t have a mummified hand. But if you enter the church, and look immediately up and to the right as you do so, you’ll see the unlucky appendage dangling from a chain from the ceiling. But why is it there? That’s a very reasonable question. Legend has it that it’s the hand of a thief, who took a bit of a fancy to the jewels decorating the statue of the Virgin Mary. However, the Virgin Mary wasn’t terribly pleased about having her finery nicked, so she grabbed the thief’s arm, and wouldn’t let go. The parishioners, who happened to be a guild of butchers with some very large meat cleavers, chopped the offending hand off to enable the thief’s release. The statue dropped the hand and returned to her normal pose, and the hand was chained from the ceiling as a warning to anyone else who had similar ideas. Photography is forbidden in the church (buy one of their postcards instead! ), so check out this page on Atlas Obscura if you want to see the grisly item. In the meantime, here’s a photo of another trdelnik! You have to admit: that is definitely one of the most unusual things to do in Prague. If you happen to be walking along the length of Wenceslas Square, you may see a rather fancy-looking hotel on the left-hand side (if you’re coming from the Old Town Square direction). This will be the Hotel Jalta. Why is a hotel on the list of the most unusual things to do in Prague? You may be asking yourself. It’s just a hotel. What can be weird about it? Has she been drinking too many Czech beers? No! (well, okay, maybe a bit.) The Hotel Jalta actually hides a bit of a secret. It has a nuclear bunker hidden underneath it. You can’t just stroll in to the museum, but if you go into the Jalta’s reception, the very nice staff will let you know what time the tours start, and you can wait outside until your guide takes you on a voyage into something that you never could’ve believed was there. It’s completely frozen in time, and just looks like the occupants popped out for a bit whilst you have a look around. This is where the Warsaw Pact countries HQ would’ve been in the event of war. You can even book a package with the hotel, which gives you a luxury room, and tours of the Cold War sites in the area, including the bunker. For history fans, it’s a must. You’ve reached the end of your tour of the most unusual things to do in Prague. You deserve a good beer. So how about seeing it being milked from the teat of a cat? Well, sort of. And rest assured that there’s no cruelty to moggies involved; cats are my life. Instead, as you step into the U Dvou Kocek pub/restaurant, you’ll be greeted by a giant mural of the pub’s delicious beer being milked from a cat, who doesn’t appear to mind. It’s a tribute to the fantastic taste, and the restaurant’s slight obsession with cats – check out the kitties decorating the bar! If you pop in here for lunch, try out the roast pork and bacon dumplings; both are delicious! Congratulations; you’re now versed in the most unusual things to do in Prague! And you too can love the city, but think it’s a total weirdo at the same time. Let me know if you’ve experienced any of these! Drop a comment below! Or, if you’d like to share this with your friends, hit the appropriate social media buttons, or pin the below image to Pinterest! I’ll love you for it! Ha ha, I love a classic ‘unusual things to do’ list! Prague looks like an interesting, beautiful and crazy place all rolled into one. I’ve been wanting to visit for YEARS and will definitely check these places out. I love getting my bearings in a new city by climbing a hill or tower, so Petrin Tower will be first up! Ohhh yes, definitely visit Prague! It’s a wonderful mix of history, culture, modernity, and utter weirdness – it’s a great mix! And it’s a really friendly place! Loved Prague, not so much the John Lennon Wall, way too many buskers competing for songs and people fighting for space when trying to Instagram against it! Wish we had tried the KGB museum though, that does sound like fun. Ahh, interesting! When I went to the Lennon Wall, there were no buskers at all – maybe it was the wrong time of year or day? I guess I got lucky! But there were indeed an awful lot of instagrammers! This post made me chuckle, and I am honestly disappointed that I didn’t do all these things on my last trip to Prague- especially the nuclear bunker that would have been interesting. It really is! Such a wonderful place; I honestly fell in love with the city straight away. You win the award for the most entertaining post I’ve read this week haha. When I think of Prague, I imagine the stereotypical historical European city with lots of pretty architecture and quaint cafes. Clearly, I am imagining the wrong city though!! What the heck is with the creepy baby statues?!? And that KGB museum sounds really fun! Heck yes I want to handle old Soviet weapons lol. Love this! Love mg I am dying. This is hilarious. I need tovisit Prague ASAP. Who knew you could milk a cat for beer or see a giant spinning head of Franz Kafka. Prague really is the cute guy with all the girls texting like whoa. I love this post! So many great tips! I didn’t do half of the things on this list when I went 🙈I guess that’s a great excuse for me to go back! Haha! Do we ever need excuses to go to Prague? 😀 But definitely go back and try these! So many great tips! Adding it to our list of things to do when we go back. This is a great list! Prague / eastern Europe have been on my list of places to visit for a while, so I’ll be bookmarking 🙂 . What was your favorite unusual thing to do in the city?? That’s a really hard one! The KGB Museum is definitely memorable, Our Lady Victorious is highly impressive, and the Museum of Communism is moving and informative – I think it’s probably one of those! Me too! And there’s so many unusual things to do in Prague – I honestly had to leave a few off the list! 😀 Such a wonderful place; I truly loved it. I love your lists! You found so many random and interesting things to do! I always really love your chatty writing style too. It’s like reading a list written by a hilarious bestie, rather than an impersonal review of the quirky things to do.